At Arlene’s Flowers & Gifts, our designers are excellent and are up to the challenge of doing the most creative of designs. We’re a local Richland, Washington florist proudly serving the area with a lovely variety of fresh flowers and creative gift ideas to suit any style or budget. We hope you enjoy your online shopping experience with secure 24-hour ordering right at your fingertips. If preferred, you may call us to place orders direct at (509) 946-7676 or 1-800-692-0706. It is our pleasure to assist you with any local, as well as worldwide deliveries and remember that corporate accounts are always welcome. For your convenience, we offer daily floral delivery to local funeral homes and hospitals. Floral arrangements can also be purchased at Kadlec, Kennewick General and Lady of Lourdes hospital gift shops. We continually replenish the flower cooler at each hospital gift shop. Large selection of plants and unique gifts ~ Choose from our Green & Blooming Plants, Dish Gardens, Fruit & Gourmet Baskets, Gift Baskets, unique and “on-of-a-kind” vases and other types of containers, (tea pots, watering cans, hand crafted wooden trucks –for the guys) available in our gift department. We carry balloons (mylar, latex, and the 28” singing mylar, …ask about them, they are great!!! We also carry wonderful chocolate truffles, green and blooming plants, Euro-gardens, dish garden, plush animals, books, greeting cards, candles, and other gifts for “that hard to buy for” person. 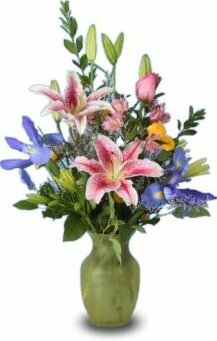 Thank you for visiting our website with flowers delivered fresh from your local Richland, WA flower shop and convenient online ordering 24 hours a day!